Fresh and whimsical style of the Harmony Organizer fulfills all of your organizing dreams with weekly/monthly planning pages, internal pocket, room for business cards, pen loop and magnetic snap closure. The internal pocket on the canvaslike front cover includes four easy-access slots on the front cover. One slot has a clear plastic window for easy visibility. 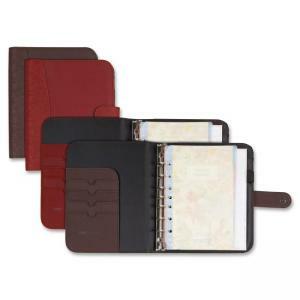 The binder offers a 1-1/4" capacity and includes 66 undated weekly planning pages and 12 undated monthly planning pages. The two-page-per-week spreads have Monday-through-Sunday scheduling and ruled hourly appointment times every day from 7 AM to 10 PM and a column in the middle labeled "Don't Forget." The binder portion also includes nine To-Do pages; note pages; birthday and anniversary page; Hotel; airline; car rental; 800 numbers; area codes and time zone information pages; double-letter tabbed address pages; page marker ruler; notepad and zipper pouch. Planner is refillable.